This product is a great reinforcement to use during calendar time! It allows you to review math skills daily. Three versions are included in the purchase. 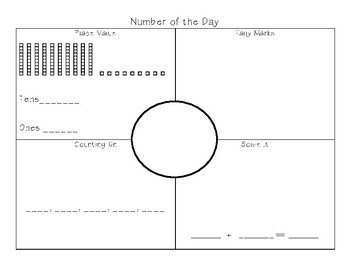 All versions include place value, tally marks, sequencing, and a number sentence. The first version includes an addition number sentence, the second includes a subtraction number sentence, and the third version has no symbol allowing you to change between addition and subtraction as you would like. I use this as part of my calendar time with my special needs first grade class, and the reinforcement greatly helps!